I just read that the best way to lose weight is by eating breakfast. Usually my breakfast consists of a cup of coffee followed by the rest of the pot. After finding out I could lose weight by actually eating more, I decided it was time to stock my fridge with items outside my personal food pyramid of beer and ice cream. Keeping my fridge full is difficult. The logical explanation for my fridge being empty would be that I ate the food. But the reality is I live in a grocery-store dead zone. In any direction that I drive, walk or bike, I’m more apt to bang my head on a golden arch than I am to have an apple from the grocers’ shelf fall on it. And, what’s so convenient about convenience stores? The food is unhealthy, the lighting is harsh and convenience comes with a price: high costs and poor selection. It’s ironic that I won’t step foot into a Wal-Mart when I’ll happily shop at Smith’s or Albertsons. Some people think Wal-Mart is Satan’s Superstore. I’m afraid to shop there because I have this unreasonable phobia of encountering the fleshy, fatty, dangling skin that appears underneath some people’s arms. If you’re afraid of sharks—don’t go in the ocean. If you fear getting smothered in flaps of pasty white skin when a large lady reaches for extra-strength Degree antiperspirant, then don’t shop at Wal-Mart. To keep myself from being afraid of my own fleshy appearance, I figured I could either avoid mirrors or eat breakfast. I opted for oatmeal. Then, like a switch turning on my enlightenment, I remembered seeing the Corner Market (203 East 1130 South) down the street from my house. This little grocery store that took up residence in 1928 had never blipped on my “Think Globally. Act Locally” radar. But I knew they’d have oatmeal. 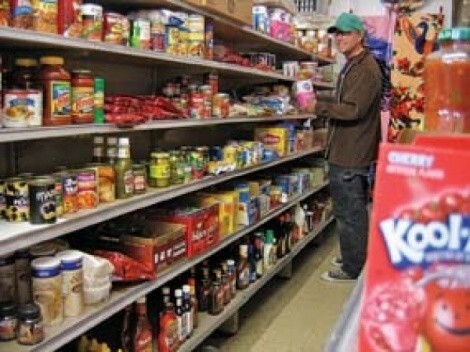 Walking into the Corner Market was like stepping onto the set of Sesame Street and into Mr. Hooper’s Store. There has been a cast change, of course, maybe because Mr. Hooper died? Or maybe because this isn’t Sesame Street, duh. 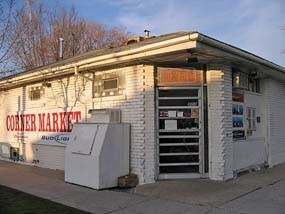 Kind Mr. Hooper behind the counter is now being played at the Corner Market by Ralph Hull, the owner. He and his wife have been selling beer, cigarettes, avocadoes, garlic and—yes—oatmeal! for four or five years. Things have changed in 80 years. Like candy from the 40 different bins of penny candy now costs a dime or a quarter. Mr. Hooper-Hull talks about the ever-increasing costs of gasoline and how the whole trucking industry can shut down America. But he still greets each customer with, “How is your baby?” or “How is your job?” or “How many packs of cigarettes would you like?” He not only is the grocer in your neighborhood, he is your neighborhood. On my way to losing weight, I left with oatmeal, milk and an 18-pack of beer, saving 20 cents over regular Smith’s prices. I still don’t know if 7-Eleven carries oatmeal, but thanks to the Corner Market, this may be the great unanswered question of my life. And, as I pushed open the doors to leave, I had an epiphany: If no one is around, and a tree falls on Forest Whitaker, I bet he’d make sound.